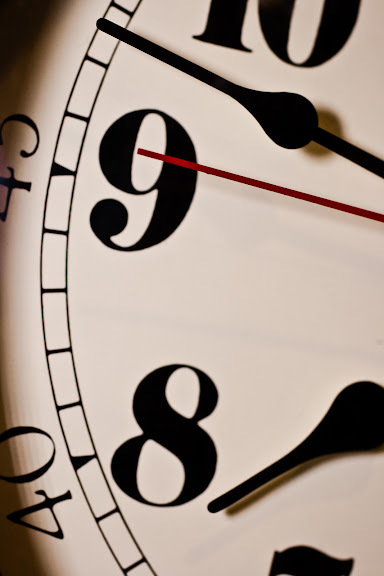 Marking the passage of time has created some of most magnificent technologies. This is a close up of the hands from a regulator clock that has been in our house for over 30 years. It chimes every 15 minutes, 24 hours a day with the Westminster Chimes. Most people notice the chimes right a way when visiting our house and comment about them. It brings great comfort on sleepless nights. Canon Rebel XTi, 1/125 sec @ f/3.5, ISO 200, 50mm compact macro lens. 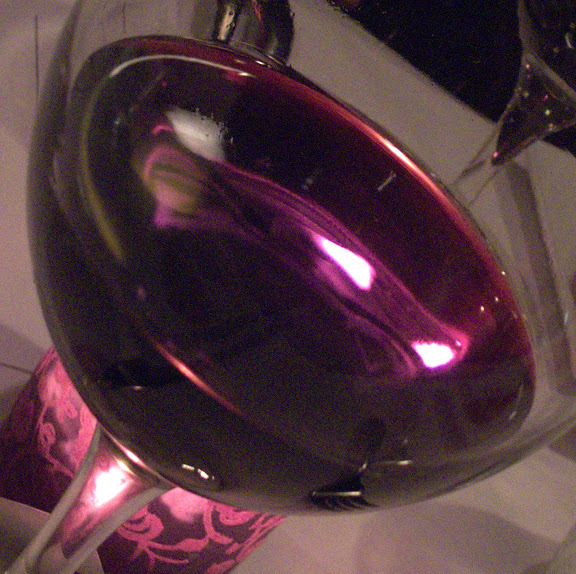 I saw this red pendant light while eating lunch today and took a closeup photo. 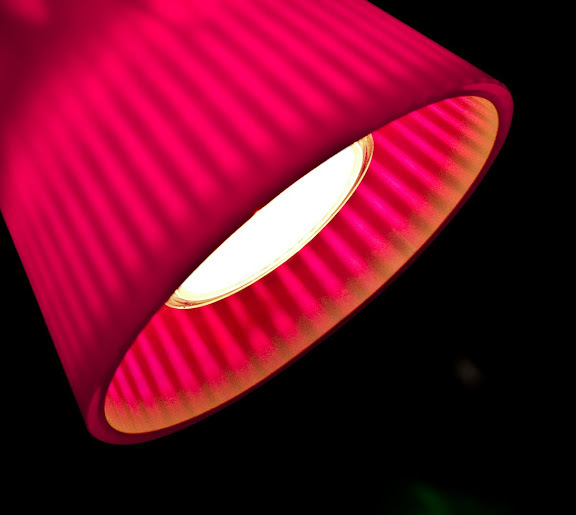 The texture in the red glass shade produces different shades of red. Canon G10, 1/160 sec @ f/4.5, ISO 200 under exposed from the camera's meter reading by 2 full stops. 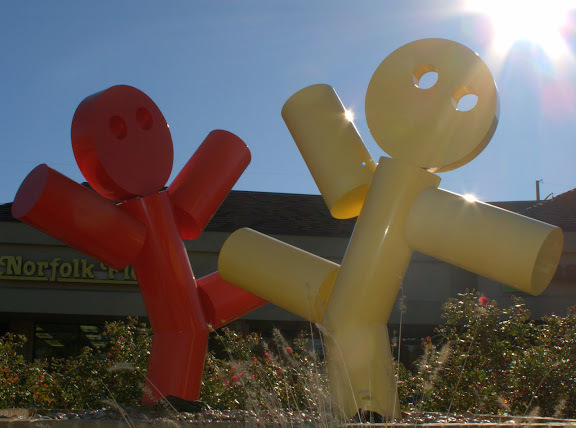 These sculptures always make me smile. 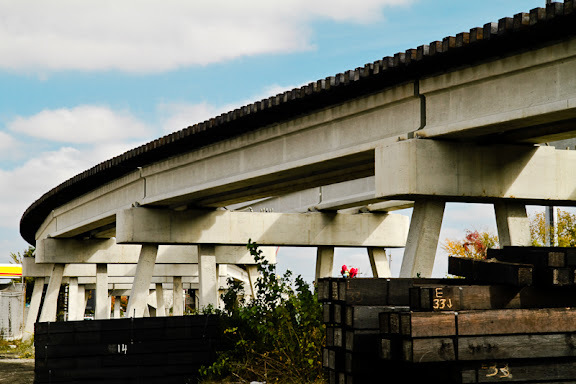 They are located at the Collins Square Shopping Center in the Thalia area of Virginia Beach, Virginia. The bright primary colors against a clear blue sky help to evoke the feeling of happiness. Canon 1/500 sec @ f/8.0, ISO 100 with infill flash. Today is "Black Friday" the unofficial beginning of the holiday shopping season. We made a trip to Virginia Beach's Pembroke Mall this evening and found no crowds. 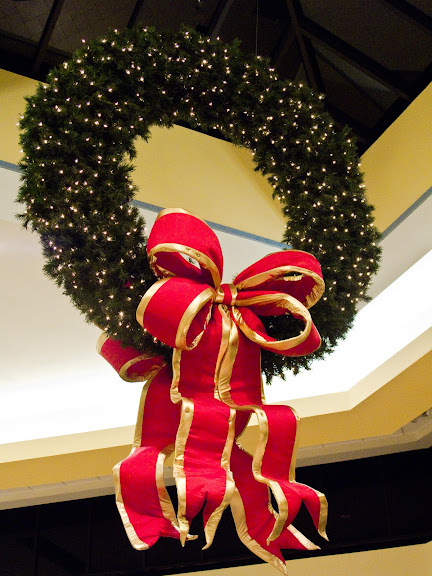 This giant wreath hangs just outside the food court. The term "Black Friday" originated in the mid-1960's by police and bus drivers in Philadelphia referring to the traffic and congestion brought on by the crush of holiday shoppers. Canon G10, 1/100 sec @ f/3.5, ISO 400. This perennial symbol of the holiday season begins to appear everywhere around Thanksgiving. 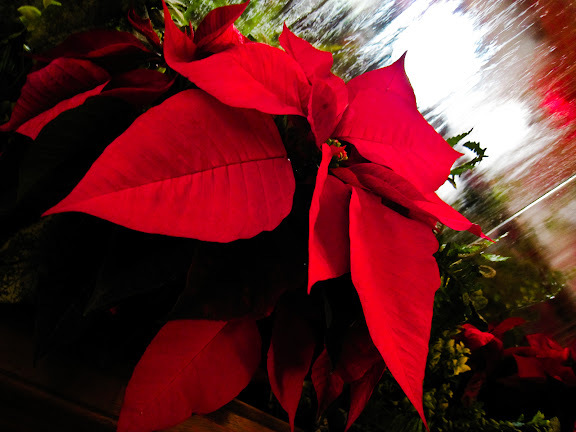 Until the 1990s, the Ecke family of Encinitas, California, had a virtual monopoly on poinsettias owing to a cultivation secret that made it difficult for others to compete. The secret was discovered and published by a university researcher and the plants are now cultivated by other producers. However, the Ecke family still controls about 70% of the U.S. market and 50% of the worldwide market. - Wikipedia Canon PowerShot SD870 IS, 1/8 sec @ f/2.8, ISO 200, in macro mode. The weather today was quite dreary. A very fine mist of rain fell all day long. This is an extreme close up of a nice light green plant in an outside landscape bed in Hampton Virginia. Unfortunately I don't know name of plant. You can see the tiny water droplets formed by the fine mist. At first it looked like ice on the plant but the macro lens nicely captured the droplets. Canon 7D, 1/250 sec @ f/8.0, ISO 100, 50mm compact macro with off camera flash at 1/64th power. Candles cast a dramatic light on this wonderful staircase in a great old house on Mowbray Arch in Norfolk's historic Ghent Neighborhood. Canon 7D, 1/25 sec @ f/2.8, ISO 1600. Blooms began opening on my camellia bush this week. There is something special about a plant that blooms when everything else is going dormant. The pedals on this pink beauty are so soft and delicate. Canon 7D, 1/250 sec @ f/5.0, ISO 800, 50mm macro lens and Litepanel Micro LED light. My Bloodgood Japanese Maple is showing off some remarkable red colors this fall. 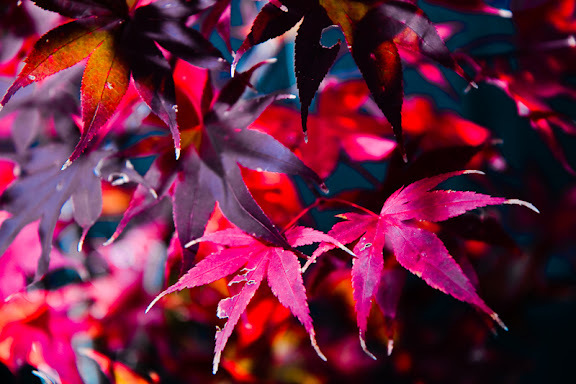 The Bloodgood is one of the most popular of the Japanese Maples and is the parent of many other newer cultivars. Canon 7D, 1/60 sec @ f/2.8, ISO 100 supplemental lighting provided by two off-camera flashes at 1/4 power. Photographers love their gear and a good tripod is a must. This collection of great legs belongs to the tripod display at the Richmond Camera store on 21st Street in Norfolk Virginia. Skilled photographers in the own right, Nicki and Jill at Richmond Camera help me indulge my gear addiction as well as providing encouragement and conversation photography. Canon 7D, 1/60 sec @ f/5.0, ISO 400, Vivitar 285HV off camera flash. 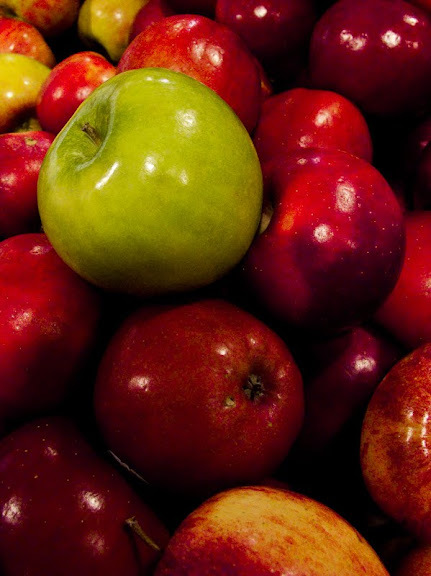 A Granny Smith sitting in the midst of Red Delicious. We know them as Granny Smith apples but the full name is the Granny Ramsey Smith green apple. It was created in 1868 through a chance propagation by Maria Ann Smith in New South Wales Australia. A hundred years later in 1968 the Beatles' Apple Records adopted a Granny Smith apple as its symbol. Canon G10, 1/160 sec @ f/3.2, ISO 400 in macro mode. 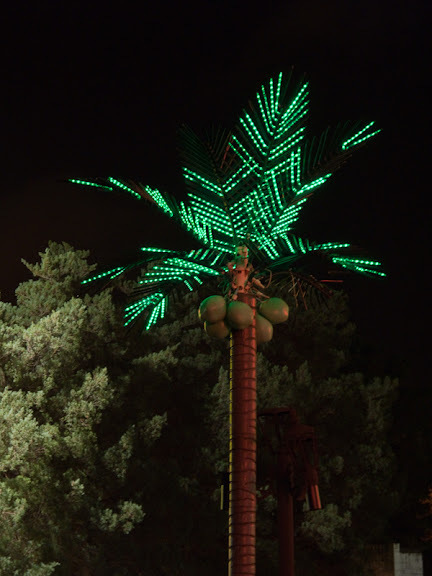 This lighted palm tree survived last week's nor'easter and its 70 mile per hour hurricane force winds. While many of the native trees toppled with the super saturated ground and high winds, the crowd pleasing lighted palms at the El Grand Mexican restaurant on Princess Anne Road in Virginia Beach will witness another round of frozen margaritas on the dining patio. This modern hybrid palm is perfectly suited for Virginia Beach's non-tropical winters and party atmosphere. Canon G10, 6/10's of a second @ f/4.5, ISO 100. Pool and fountain in front of the Exxon Building at 1251 6th Avenue (a.k.a. Avenue of the Americas) and 50th Street in New York City. I tilted the camera to mimic the double "X" in the Exxon logo. This building is part of the Rockefeller Center complex and was built in 1971. IMHO - it doesn't even come close the architectural master piece that is the original Art Deco styled tower. Canon 7D, 1/1600 sec @ f/5.6, ISO 100. The Bubble Man was entertaining young and old alike at the Bethesda Fountain in Central Park this afternoon. The park was full of activity on a beautiful fall Sunday afternoon. Canon 7D, 1/320 sec @ f/5.0, ISO 200, 55mm focal length. 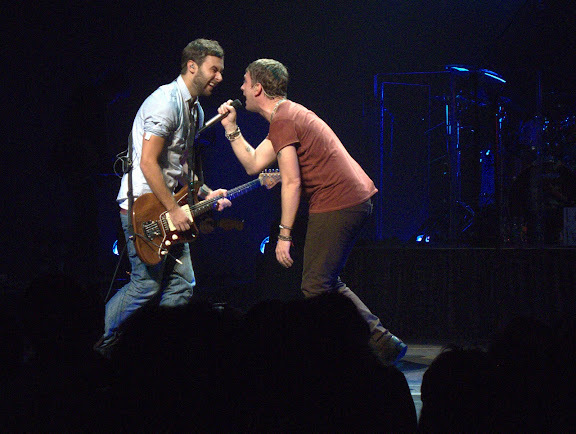 Rickard Göransson from the Swedish band Carolina Liar joins Rob Thomas on stage during the Cradlesong Tour at the Beacon Theater in New York City tonight. Over four hours of music from Rob and opening acts Carolina Liar and OneRepublic. Canon G10, 1/125 sec @ f/4.0, ISO 800. Veterans Day in the U.S. is also celebrated as Armistice Day or Remembrance Day in other parts of the world, falling on November 11, the anniversary of the signing of the Armistice to end the "Great War" on the 11th hour of the 11th day of the 11th month of 1918. The day is of particular meaning to me as my father was a decorated Army combat veteran of WWII and the Korean War. I took this photo yesterday since the forecast for a major Nor'easter ruled out today. 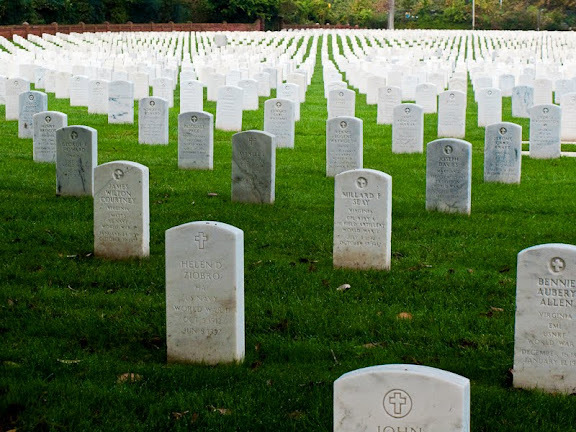 The Hampton National Cemetery was in tip top shape for the holiday. Canon G10, 1/250 sec @ f/5.6, ISO 200. 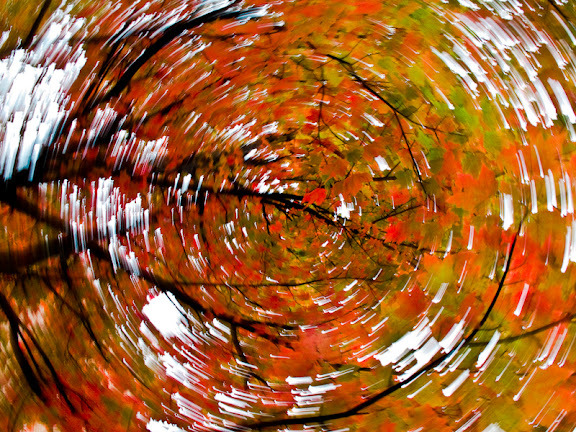 The fall colors had me spinning today. It was an overcast day and I was looking for a photo where I wouldn't have too much of a blah sky in the image. I saw this colorful tree off Westover Avenue in Norfolk's Ghent neighborhood and tried a camera rotation technique that I read about in a book by Bryan Peterson on understanding exposure. The camera is pointed up from under the tree and rotated during exposure. Canon G10, 1/4 sec @ f/5.6, ISO 200 with the camera's electronic neutral density filter enabled. 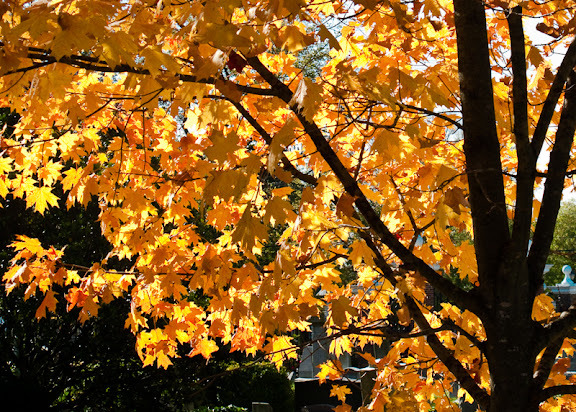 The low afternoon sun is behind this maple tree and lighting up the yellow and gold leaves. The fall transition has accelerated with the cool nights we had last week. Canon G10, 1/1000 sec @ f/3.5, ISO 200. We had to move all of the furniture out of several rooms today because the hardwood floors will be refinished next week. 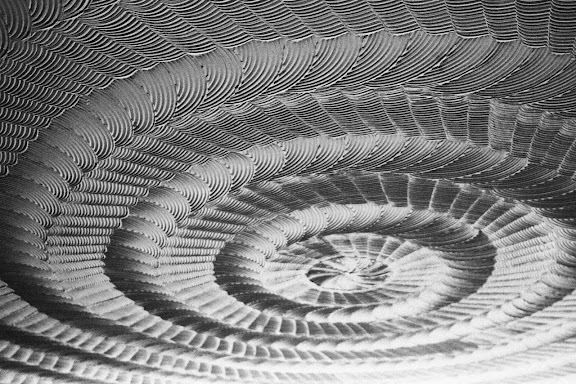 The one lamp left in the living room created an interesting look on the swirled plaster ceiling. The strong contrast really highlights the swirl pattern. 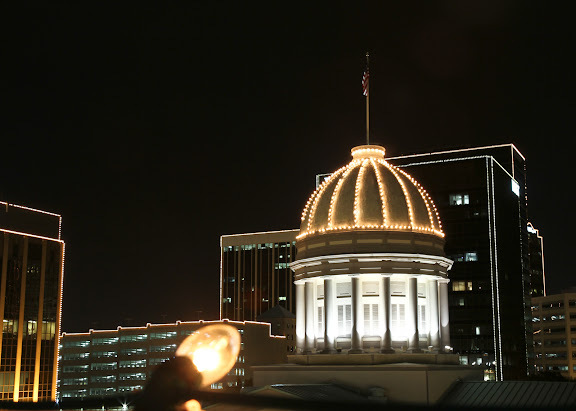 Canon 7D, 1/20 sec @ f/2.8, ISO 800, zoom at 21mm. My grandson spent the afternoon with us and was quite full of himself. 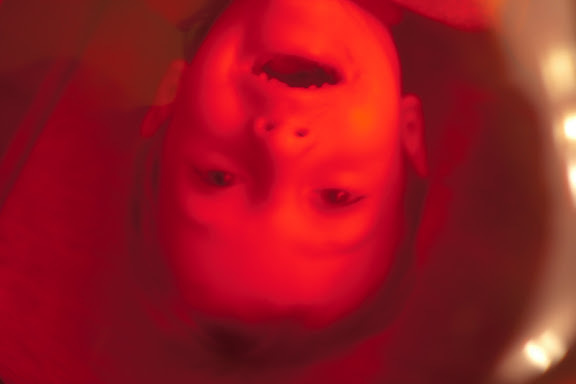 He is hanging upside down looking at me through a red plastic candy dish. The empty candy dish is a good indication of how he got so full of himself. He just loves to visit Grammy's house! Canon Rebel XTi, 1/13 sec @ f/2.8, ISO 400, 30mm prime lens. 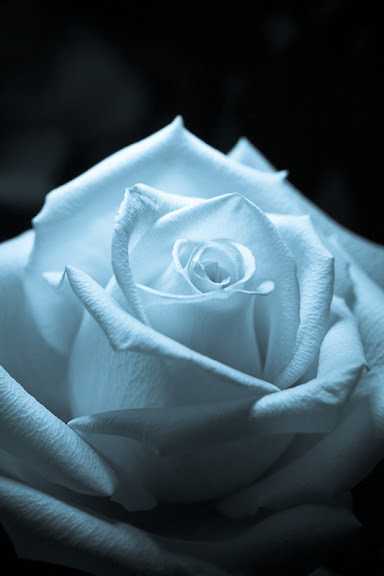 The rose has always been valued for its beauty and has a long history of symbolism. In Rome a wild rose would be placed on the door of a room where secret or confidential matters were discussed. 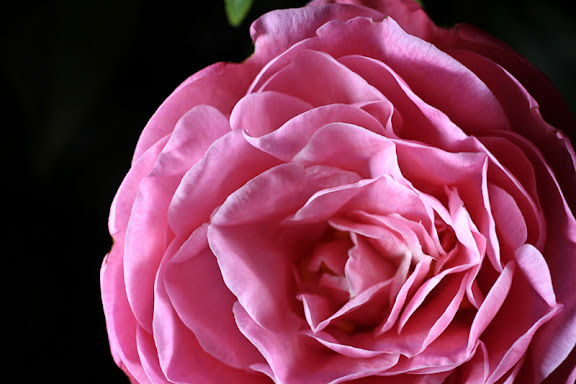 The phrase sub rosa, or "under the rose", means to keep a secret — derived from this ancient Roman practice. Canon Rebel XTi, 1/400 sec @ f/5.0, ISO 800, 50mm macro lens. Converted to B&W in Lightroom 2.5 with the Cyanotype preset. 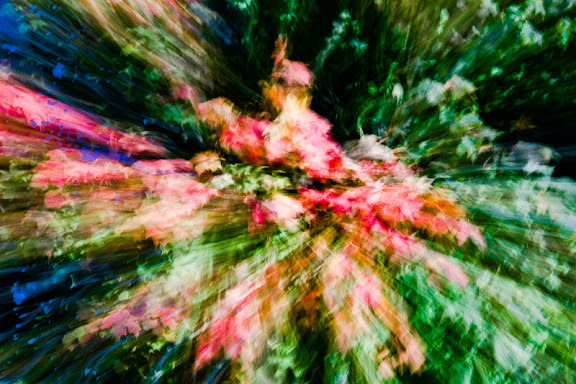 Fall colors explode from this maple tree with a little help from the camera's zoom blur. Canon 7D, 1/5 sec @ f/9.0, ISO 200 with a variable neutral density filter set at 4 stops of light reduction. The effect is completely done in camera with the saturation pumped up a little in Lightroom. I was pleased with the "impressionistic" effect. I know spiders creep out some of my loyal followers but this will probably be the last one as the spiders are getting scarce now. 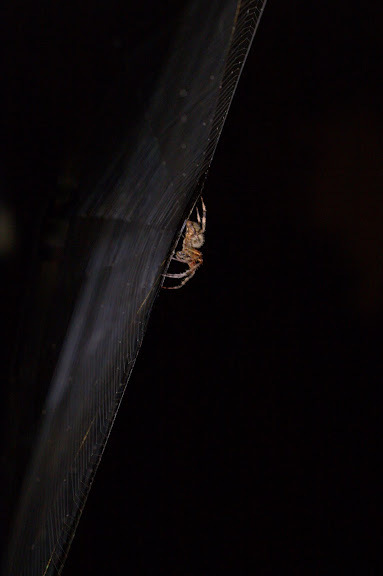 For some weeks now she has been building her orbweb just outside the side door at the house. Tonight's web was pretty spectacular and so it ends up as today's photo. Canon Rebel XTi, 1/25 sec @ f/4.0, ISO 800, 50mm macro lens. Stainless steel has amazing properties for corrosion resistance and is often associated with clean modern design. This is one of three "Library" lamp shades in my office. 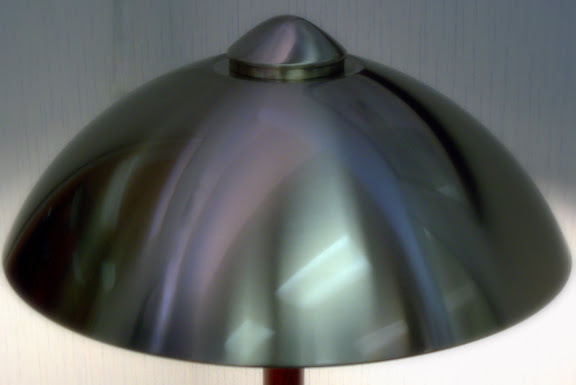 The brushed finish on the curved shade nicely reflects the overhead lights and other features from my office. Canon G10, 1/25 sec @ f/3.5, ISO 200. Oddly enough the calla lily is not a lily at all and it's not really a calla either. 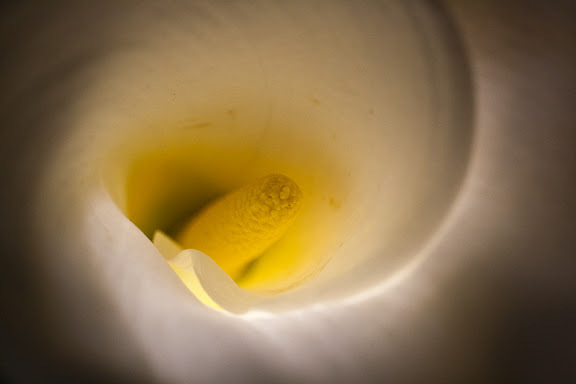 Calla lily is actually a common name for the zantedeschia genus which once was a part of the calla genus. It was separated into several smaller genuses when it became apparent they were not as closely related as biologists thought. But the common name has stuck and this beautiful flower is a beloved favorite. Canon Rebel XTi, 1/320 sec @ f/7.1, ISO 800, 50mm macro lens, illuminated by a micro Litepanel shining through the white flower.